This website provides a gateway to details about the churches within Erith Deanery. 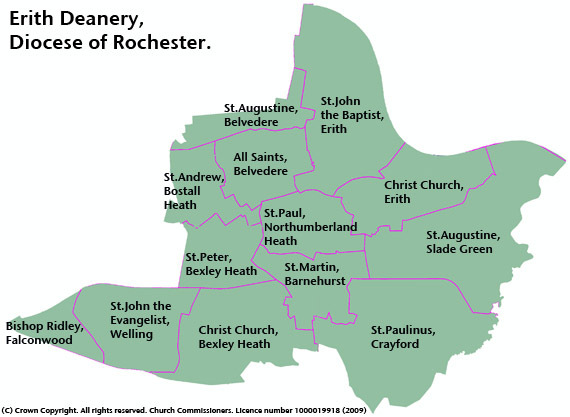 Erith Deanery consists of 13 parish churches within the Church of England Diocese of Rochester (Bromley and Bexley Archdeaconry), and is in the London Borough of Bexley (covering Barnehurst, Belvedere, Bexleyheath, Bostall Heath, Crayford, Erith, Falconwood, Northumberland Heath, Slade Green and Welling). Erith Deanery provides the opportunity for our churches to work together in proclaiming God’s Word and serving our communities; as well as coming together for regular Synods. For upcoming synods and event details please click here to see our events page. Through the Erith Deanery Youth Trust (EDYT) we continue working together to fund a Children’s and Youth Work Support Worker. This post provides encouragement, training and resources to youth and children’s workers in our Deanery. For more information on EDYT please click here. Click on the church name above to find out more information.